I may have been doing this too long—watching Halloween the other night, I was reminded of silent film. You think I mean the music. Partly I do, because music is hugely important in Halloween, as it is in so many silent movies. A knife-wielding psychotic, cruising the streets in broad daylight, in a station wagon, is not inherently scary, even if we know who is driving the car. But the score—the simple keyboard piece with its insistent rattle, composed by the film’s director, John Carpenter—gives moments like these their promise of carnage. Silent films are such moments, writ large. Anyone who has been moved to tears by a great score—or suffered through an unsympathetic one—knows this. Music was not the only connection I noticed. Recently, I wrote a piece for Silent London, about my love for early silent film. That is, the really early, pre-1915 stuff, with its static camerawork and obvious theatrical elements. One of the defining features of those films is the medium shot. They’re composed almost entirely of them. In that post, I wrote that medium shots depersonalized the actors, transforming them from individuals into elements of the frame—into things. Watch Halloween and see how often Carpenter pulls his camera back. That he does this is not a revelation—for years people have pointed out that part of what makes Halloween so disturbing is that we see, at times, what the killer sees—we see his victims from the same distance, and from the same angles, that he does. But in fact, we also see people in Halloween the way the killer sees them even when he’s not around. Take, for example, an early scene in Laurie Strode’s (Jamie Lee Curtis’) second-floor bedroom. Laurie sees (she thinks) the killer, staring up at her from the lawn below. She shuts the window in fear, but doesn’t otherwise move. The camera moves; retreating from her, making her small in background, putting a telephone large in the foreground. Then the phone rings, scaring the bejeezus out of us. We’ve already gotten to know Laurie. We like her. But when she’s made small like this, she becomes an object to us. Like something to be manipulated. Like prey. Though it’s involuntary, we don’t like ourselves for thinking this way. That’s how the killer, Michael Myers, thinks about everyone. This post is more than halfway through and I still haven’t explained what the film is about. Forgive me if I assume you’ve seen it. 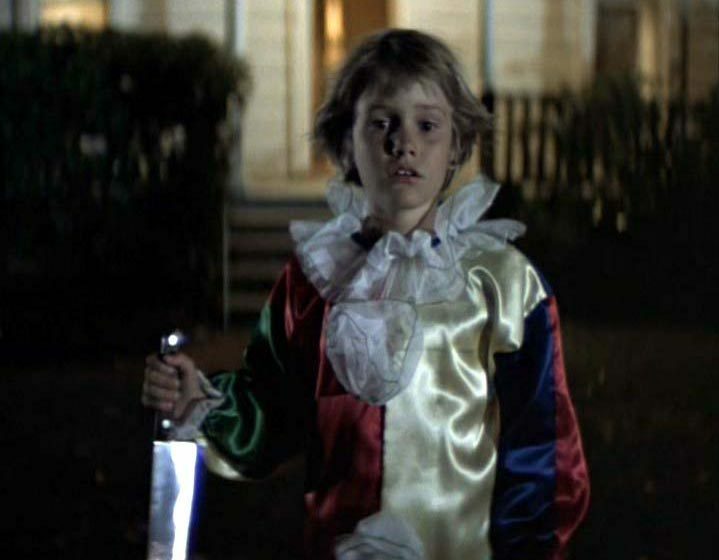 Halloween, made for a mere $320,000 in 1978, and starring only one actor of note, grossed $47 million in the United States alone. It spawned multiple sequels, and a remake, though none directed by Carpenter. It was a direct precursor to, and influence upon, the slasher flicks that dominated mass market cinema in the 1980s. I was a child in that decade, and those movies were a constant topic of conversation for me and my friends, even if we weren’t able to see them. Especially if we weren’t. I met this six-year-old child, with this blank, pale, emotionless face, and the blackest eyes—the Devil’s eyes. Of course Myers does escape. 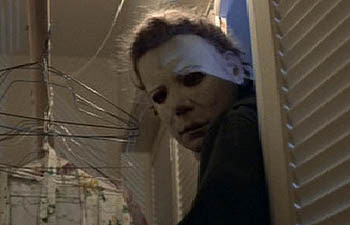 He returns to Haddonfield, the scene of his crime, and begins stalking teenage girls. 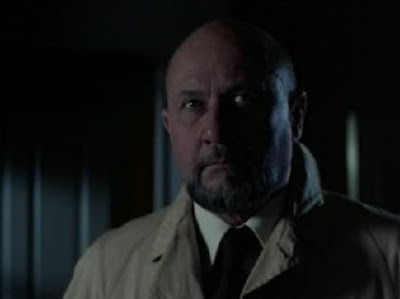 Though no real attempt is made to explain Myers’ thought processes (Loomis simply describes him as ‘evil’), it seems he preys on girls for two reasons. The first is that he associates them, due to their age and physicality, with his sister. But Myers also tries to kill men. 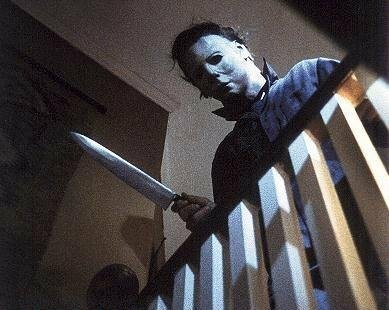 The second, more frightening reason, is that Myers, by sheer chance, sees Laurie setting foot on the porch of his family’s abandoned house. From then on she is connected, in Myers’ mind, to that house. Everyone with whom she has contact becomes connected too. I bet this web of associations, tenuous as it is, resonates powerfully with younger horror fans today. Halloween follows Laurie and her friends through their day, and into Halloween night, which they spend babysitting and bed-hopping. The bulk of the film takes place within one block, primarily in two neighbouring houses, each visible from the living room of the other. Through various contrivances (some clever, and others, admittedly, a reach), the teens are wiped out. These murders are depicted with practically no blood—something that surprises a lot of people. If you’re unable to guess who’s left when the carnage concludes, then it’s time you watched Halloween. Is Halloween still scary? Yes. It is stiffly acted, corny, predictable, and often unlikely, but it still works, because the levers it pulls are connected to primal points in our psyche. You can analyze Halloween, but you cannot fail to be impacted by it if, in fact, you’re serious about watching it. That’s how it is with all great movies. Don’t like horror films? Rent this one. And good hunting. Halloween has been available on video for years. You can find the Blu-ray edition here. And if you’re in Toronto on November 17th, you can see Halloween the old-fashioned way—on the big screen—at TIFF Bell Lightbox. It’s being screened as part of an upcoming retrospective: Birth of a Villain. I think Carpenter has made a career of accessing our primal points. It's interesting how he even does it with his musical scores--they are seamlessly integrated into his filmmaking--it's all a whole in the most brilliant way. You describe that appeal very well.